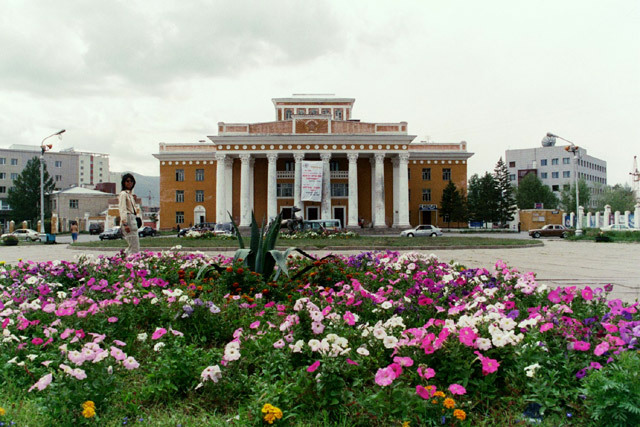 Start Ulan Baatar (Bolod Guest house) N47º54.724' E106º54.379' 1,291 meters . Finish Ulan Baatar (Bolod Guest house) N47º54.724' E106º54.379' 1,291 meters . Weather: Mostly cloudy, cool and breezy. We will spend this day touring as much of the city as we can. We have asked Gerlee to return this morning to drive us to some of the sites that are a bit further away. We were supposed to return to Ulan Baatar today at 1 PM, so we have paid for the jeep and may as well take advantage of it to save some time. We have a quick breakfast in the guest house and Gerlee arrives right on time, so we head out as soon as we are ready. Our first stop is to drop off some laundry. Despite a disagreement on what the price should be (they seem to contradict their own sign), the price is still reasonable, so we drop off a huge load. 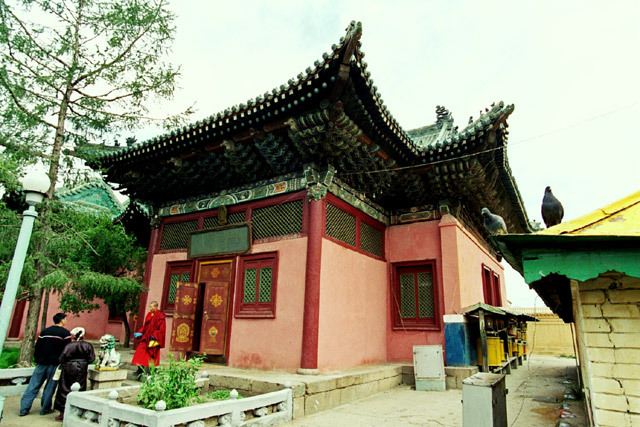 Then it is off to Gandantegchinlen Khiid monastery. 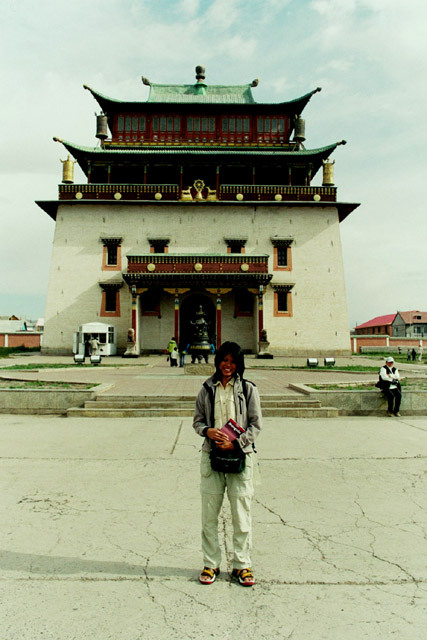 This is the largest and most important monastery in Mongolia and we spend some time checking out its several temples. We first check out the two temples the Ochirdary Süm and the Golden Dedenpovaran Süm. In one of the temples, there is a ceremony going on, with the older monks performing the service. And that is just what it seemed like - a service as one would have in a Christian church. It appeared to have many rituals and steps and props were used throughout. Believers were trying as hard as possible to be involved and touch some part of one of the monks or the props. Some form of seed was being thrown all over a bowl that was being held aloft by another monk. There was constant chanting. In the second temple, it was quieter. This seemed to have more novice monks, who were sitting on benches and reading prayers aloud. 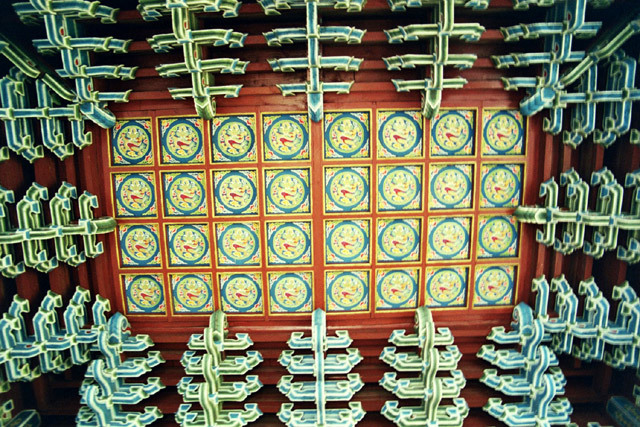 We quietly walked around both temples and left small offerings in each. Then it was off to the monastery's main attraction. At the end of a long path is the magnificent tall, white Migjid Janraisig Süm. We need to pay a $1 entry fee (no longer voluntary) and head into the temple. The walls are covered with thousands of smaller Buddha images, but what grabs your attention is the 25 meter, 20 ton statue in the center of the temple. It is made from copper and is gilded with gold and contains many precious stones. This one, completed in 1996, replaced a 20 meter gold and bronze statue of Avalkitesvara built in 1911 that was destroyed by the communists in 1937, with the metal taken to Leningrad and melted down to make bullets. Once we leave this temple, we spend a few minutes wandering around the grounds admiring the rest of the architecture before leaving the monastery. We hop back into the jeep and take a short ride to the Gesar Süm, in the hope of maybe seeing some of the long horns being blown. But no luck, so we carry on. 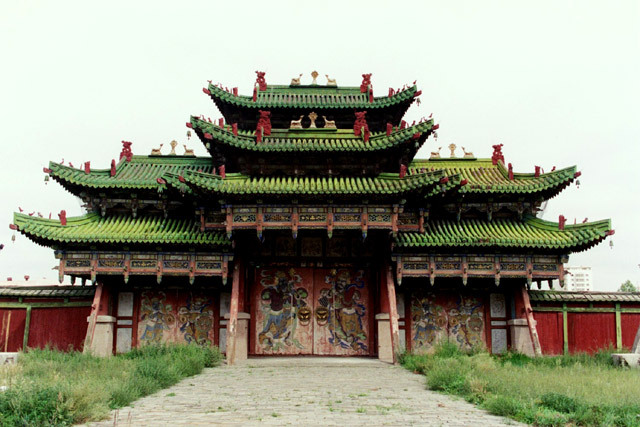 Our next stop is at the Winter Palace of Bogd Khaan. 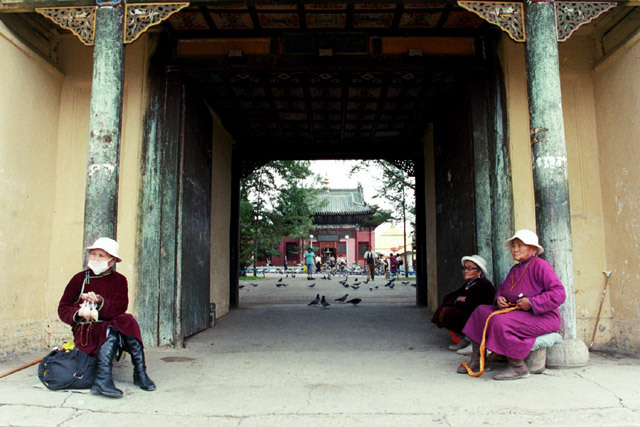 The winter palace was built between 1893 and 1903 and was used by Mongolia's eighth Living Buddha and it's last king. The summer palace was destroyed by the communists, but the winter palace, for some reason, was preserved and turned into a museum. We spend some time touring the various room of the palace, which are filled with an exotic collection. The king liked to collect stuffed animals. He also had a ger lined with the skins of 150 snow leopards and a coat made from the fur of 70 foxes. We also some parts of the elephant that the king has in his collection. They also had some interesting scrolls, costumes and other items, but there were no Very few English labels, so it was hard to appreciate what we were looking at. 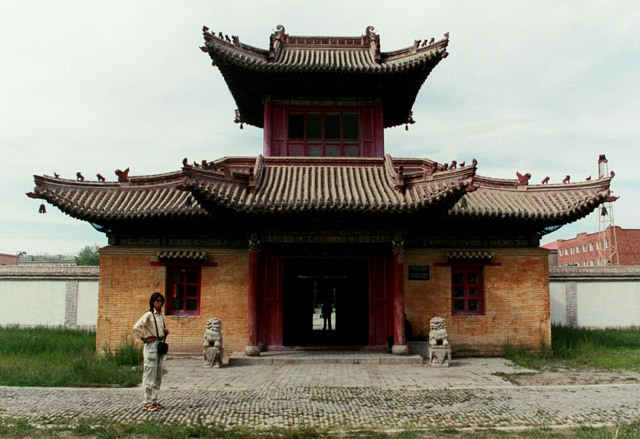 The palace itself is very grand and the gates and walls are made in the tiered, roofed pattern. As pictures are not allowed inside, except with the payment of an exorbitant fee, we have to restrict to photos taken from the outside. It is now already noon, so we head back to the guesthouse, stopping along the way to collect our laundry. Back at the guesthouse, we relax for a bit, settle the balance of our trip fee and also have our train ticket delivered. Then it is time to head out for lunch and some more sightseeing. After our quick bite, we head over to the National Academic Drama Theater and purchase tickets for the concert tonight. The next stop is at the Museum of Natural History. We spend some time wandering through the rabbit warren of rooms that are scattered over the three floors of this old museum building. As there are not many English labels, we have a hard time appreciating many of the exhibits. The highlight of the visit is the dinosaur section, where we can see the complete skeleton of a Tarbosaurus and the famous "Fighting Dinosaurs" - this amazing fossil is of an 80 million old Protoceratops and Velociraptor locked in mortal combat. After the museum, we make our way back to the guesthouse via the post office, where we buy some stamps. We just have time to drop some of our stuff and catch our breath before heading out again to go to the concert, that starts at 6 PM. We walk the short distance to the theater and arrive just in time for the performance. And what a performance it is - we can highly recommend such a show of traditional song and dance. It last about an hour and a half and we saw a full range of dances and singing and music put on by the Mongolian National Song and Dance Academic Ensemble. The cast was large and they varied the performance, having dances interspersed with songs. We just wish they had more of the throat singing - that was very well done and fantastic. They filled the theater with the sound of their throats. It really felt like we were out on the steppes in the days gone by. We could feel the ghost of Chinggis Khaan and his vast armies racing across the steppe and into battle. Once the concert was over, we headed out for a quick bite to eat. We picked out one of the local places - no English menu, but we were able to order up some dishes with a combination of hand gestures and translation of the Russian menu with the few words that we knew. It was pretty good, just not the best as it was not freshly made. That is the problem when you have had the freshly, home made version. The rest never taste as good. After a brief stop at the internet cafe, we return to the guest house where we spend some time working on our journals before we retire for the night.